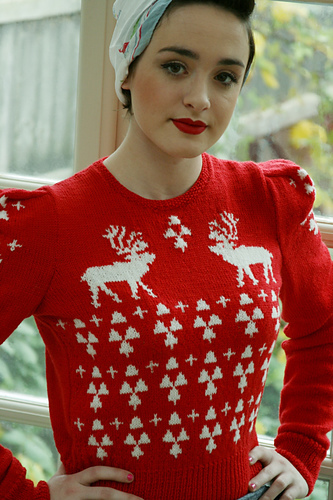 So, Christmas is just around the corner and Jumpers are all the rage this season! In the States we call a "jumper" sweater. I prefer using the term jumper instead of sweater….it sounds a bit puzzling which makes people think I am talking about something new and important. Dolce and Gabbana featured many versions of the Christmas Jumper/Sweater in their winter/fall 2010 collection. My first fashion job was at a major company where my boss was from the UK. He suggested that the entire design team wear their "ugliest Christmas jumpers" to our office Holiday party. It was a horrendous collection of stitched on reindeer heads, Christmas bulbs, and my favorite the talking Santa head that lights up. I don't actually have pics from the party but, I did find some other fun pics to share. I'll let you be the judge as to what's hot and what's just plain awful!